The Highways Agency has begun a public consultation on its plans for a major road scheme to upgrade the A14 between Cambridge and Huntingdon. The proposed £1.5bn scheme will add much-needed capacity on the 22-mile route, including a shiny new 12-mile bypass around Huntingdon. The A14 is a strategically-important route, which links the Midlands to the Haven Ports on the east coast, with nearly 85,000 vehicles per day using some sections of the route in Cambridgeshire, around a quarter of which are HGVs. Work is due to get underway in late 2016 (subject to statutory processes and continued value for money), with completion expected in 2019/20, the Agency says. The planned charges could be between £1.00 and £1.50 for cars, and around double this amount for heavy goods vehicles, the HA says, adding that it is proposing to apply these charges between the hours of 0600 and 2200 seven days a week. Vehicles using the tolled section of road during charging hours would be identified using automatic number plate recognition cameras, with no toll plazas. The public consultation will run from Monday 9 September to Sunday 13 October. 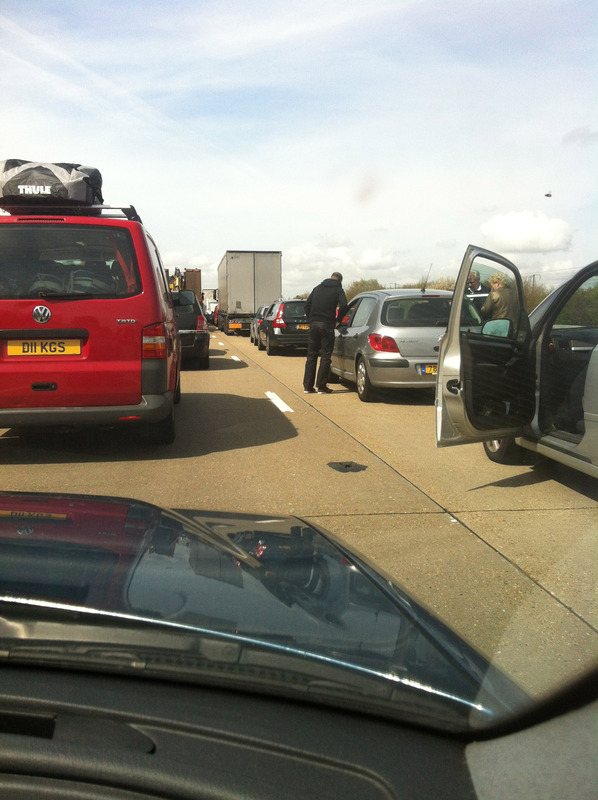 M20 accident on Saturday. The road to nowhere but why didn’t the @highways_agency tell drivers? Of course it would happen when we were in a rush, the children were hungry and desperate for the loo. There’s never a good time to be stuck in a stationary jam on the motorway, but some occasions are more bearable than others. Early Saturday afternoon on the London bound carriageway of the M20 in Kent was not one of them. We were almost at J8 when we came to a standstill, the reason for it a long way ahead and out of sight. The appearance of numerous emergency vehicles – ambulances, police cars, fire engines – overtaking us up the inside along the hard shoulder made us fear the worst, both for the unfortunate people who were inevitably involved in the accident and for our ability to get to our destination before the time came when we would have to be leaving to return home. As it turned out, our discomfort only lasted about an hour before we were on the move again, the carriage-way being completely clear by the time we reached the point where things had gone awry. Thankfully there were only a couple of vehicles on the shoulder and neither appeared too badly damaged. According to the news on the local radio – which we heard as we sat waiting to get going – two people had been taken to hospital. Fingers crossed neither were too badly hurt. What was disappointing was the lack of information on the Highways Agency website. As far as I could tell, from two visits to their website on my smart phone during the first 35 minutes of my enforced halt, there was no official mention of the tailbacks. Why not? It is their road. One of their vehicles was in attendance and a matrix sign warned of closed lanes (so someone back at base in front of a computer clearly knew what was going on). And the disruption was all over the local news. If the HA desires to be a source of data for drivers wanting to make an informed decisions about when and where to travel then the info needs to be available and up to date. I stand to be corrected, but as far as I could tell on Saturday it wasn’t.